Thank you for visiting my Internet site. Just like Dr. Franklin himself, I strive to make use of the science and technology at hand to improve life. Dr. Benjamin Franklin -- entrepreneur, printer, author, scientist, inventor, statesman, ambassador, and one of America's Founding Fathers -- was an extraordinary man in any century. To call him an 18th century "Renaissance Man" is an understatement. The emphasis of this site is on bringing Dr. Franklin to life for your school, organization, or historical site. This site will be seeing many new updates in the near future - look for them! 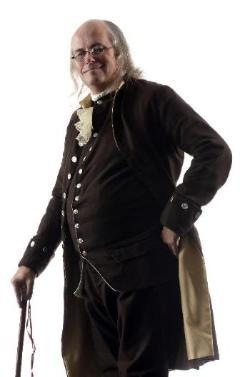 Jack Sherry has been portraying Benjamin Franklin at historic sites, schools, civic organization events, and for historical societies since 2003.